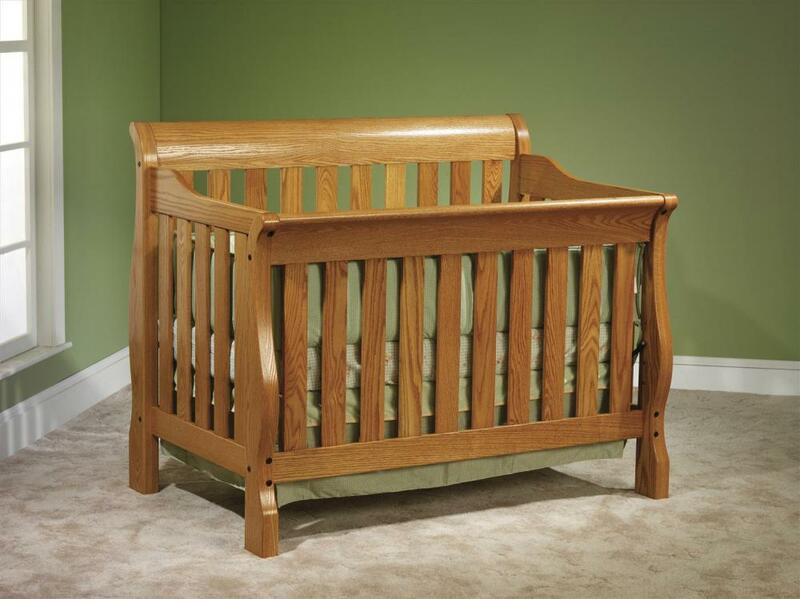 Beautiful solid wood cribs in a totally green way. All of these cribs turn into full sized beds for extended use and are heirloom quality. This company also makes changing tables, armoirs, beds and dressers to match. These are "upscale" priced cribs and furniture.They are handmade to order by the Amish, and have a 2+ month lead time. All furniture is available in your choice of Linseed Finish or Organic Stain and choice of wood. Linseed Oil or unfinished will be the least toxic option of wood finish. It will not change the natural color of the wood, but will just bring out the grain of the wood nicely. For darker color options a stain must be used. The stain and finish over it are formaldehyde free and pass child safety standards, but do have some chemicals in them. *FORMALDAHYDE FREE FINISH AND ORGANIC-MINDED BUILD: Absolutely NO chemicals in the wood that is used in the construction of the furniture. So it has solid wood construction, with formaldahyde free backing and drawer bottoms on the casegoods. All Kid's Comfort Organic products are hand-crafted and hand-assembled by skilled craftsmen in Holmes County, Ohio. Using local labor and resources. All Kid's Comfort Organic products are made with solid wood materials. There is absolutely no plywood or particle board used to make our products. All Kid's Comfort Organic products are stained with a natural finish made with organic raw materials from plants, minerals and other natural raw materials. All Kid's Comfort Organic products are finished by hand rubbing two coats of organic stain and one coat of clear natural organic wood finish. It is offered in light, medium, & dark colors on all woods. All Kid's Comfort Organic products use lumber that is certified by the Forest Stewardship Council. This certification makes sure that the wood is locally sourced and responsibly harvested. Kid's Comfort Organic construction waste is minimal as excess wood scraps and sawdust are used for heat. Also, wood chips and shredded paper are used for animal bedding. There are NO imported products in the manufacturing of Kid's Comfort Organic products which keeps our carbon footprint low. *****A SHIP QUOTE is also required as there is NO FREE SHIPPING on these items. Shipping usually costs between $400 and $700 with a quality carrier who will care for your handcrafted furniture during transit and includes set up. Please e-mail(link is external) us for a quote and include your zip code.